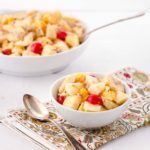 A recipe for Mom's Fruit Salad made with apples, bananas, orange, cherries, pecans, and a creamy dressing. It is a low-fat side dish or dessert. Peel and core the apples, cut into bite-sized pieces, and place pieces in a large bowl. Peel and cut bananas into 1/3-inch slices. Add slices to the bowl. Cut off the outside peel and pith of the orange. Cut the orange flesh into bite-sized pieces over the bowl so the juice and flesh pieces drop into the bowl while cutting. Add cherries, pecans, lemon juice, sugar, and 2 tablespoons of yogurt to the bowl. Gently stir to combine. Add more yogurt if desired for a creamier dressing.